Guess What I’m Doing In Two Weeks? 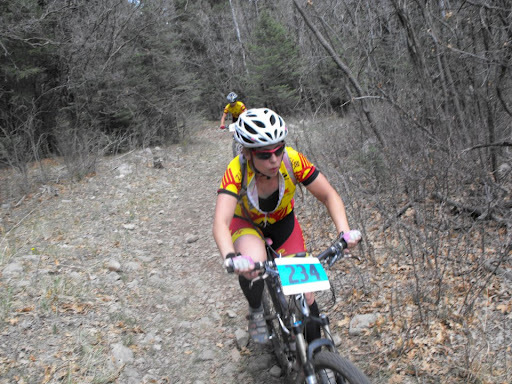 In two weeks, I will be competing in a 12 hour mountain bike race with three other guys. We are going for the gold for Coed 4 man Team. Last year, I was on another Coed Team called “Lady Cluck and the Boys”…and each time I rode around on my lap, they would say “There goes Lady Cluck!”. As hesitant as I want to admit it, I am a little superstitious when it comes to race day. There are certain rituals that have to be done in order to make sure we are calm and ready for a race. For a while it was never discussed, until we finally came to terms and told each other things we HAD to do or else it would ruin any routine we had. Superstition #1: You must eat a bowl of oatmeal before the race. We seriously love Starbuck’s Perfect Oatmeal (if you haven’t tried it, do it…and its only $2.95!). Even if you have to force it down your throat, which I usually end up doing out of nervousness, you must eat some! Superstition #2. Let me back up a second. You have to have a night before meal which consists of chicken pad thai (from Thai Delight) and salads. It is fuel for the legs and lungs. 🙂 Anything else, leaves you less than ready for the next day. Superstition 3 : If there are bad songs on the radio, then it will be a bad race. Only good tunes allowed. Superstition #4: No talking before a race. We both are nervous, therefore we just make it worse if we talk. It helps to avoid any confrontations. Superstition #5: Mike must check the front tire of my bike. Even if I know its on, I’ve raced where the tire flew off and it wasn’t pretty, so Mike has to check it and put it on each time from now on. That about sums up the basic superstitions we have. If these rules are not followed, catastrophe lies ahead. P.S. 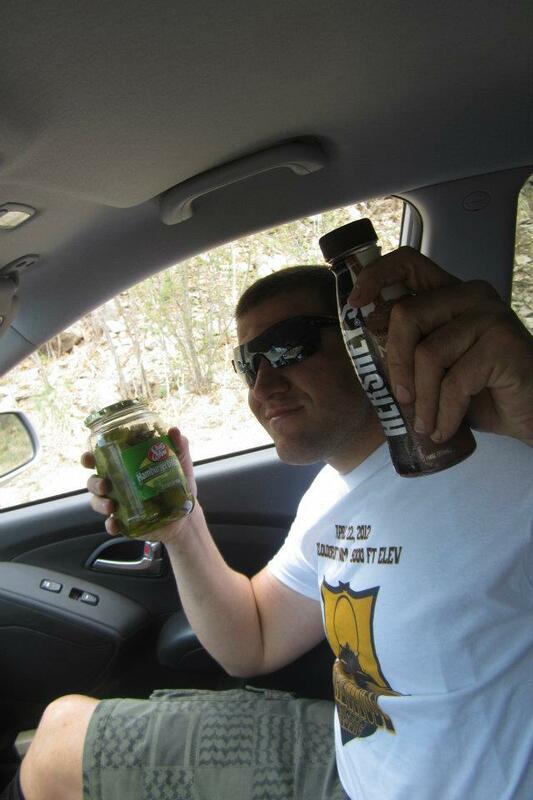 Chocolate milk and pickle juice. Awesome after race combination. 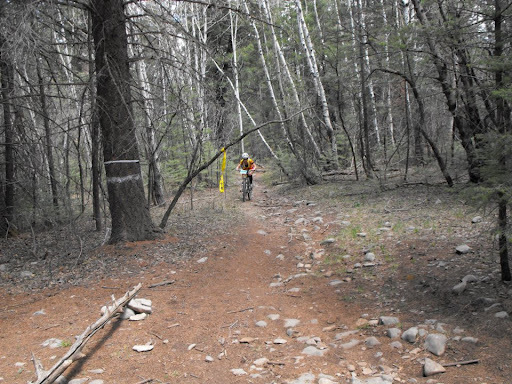 So I want to critique myself after my last race in Cloudcroft. I really want to write down what I was thinking during a race, but I always forget. I really suggest to anyone that you keep a notebook of any kind of racing you do. I really regret not doing that the past three years. The HUGE thing I regret is not practicing for the race. One week of training is not enough. This winter I was really behind on riding. I felt lke I lost a whole year of riding and I know in any situation its quicker to lose your abilities faster than you gaining an athletic ability. It started out great. I pushed really hard, but the race had a lot of uphill. I am glad I stayed at the front of the pack, but I really think I should have backed off a little just to make sure my legs didn’t burn out. Believe it or not (if anyone knew how I rode), I was better on the downhill than the uphill. I am known for my hill climbs, but I think I was having a hard time because I pushed too hard. This is what I looked like at the end. Hot. Zipper down on my jersey. Out of breath. Fish face (see Fitness Topics). And not happy. But hey, I was second in my category at least.